Dutch FA president Michael van Praag is to stand against Sepp Blatter for the Fifa presidency. 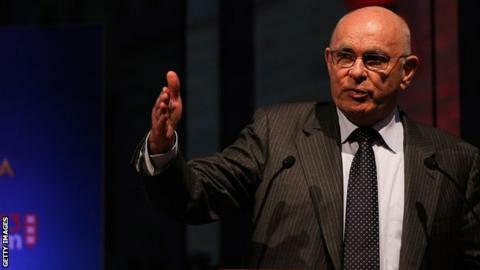 Van Praag, 67, said in a statement he had the necessary nominations from five football associations. He added: "It is high time that the organisation comes back into the real world." Blatter, Van Praag, Jordan's Prince Ali Bin Al Hussein and possibly Jerome Champagne are set to be confirmed as candidates after Thursday's deadline. Former France international David Ginola has also declared his intention to stand but may not gain the necessary support. Fifa electoral committee member Dominico Scala has said it will only start assessing candidates after the deadline and they must pass an anti-corruption test before they can be confirmed. 2011: Blatter was unopposed because his rival Mohamed Bin Hammam, president of the Asian Football Federation, pulled out after being suspended over bribery allegations. 2007: No other candidate was put forward to challenge Blatter. 2002: Blatter saw off the challenge of Issa Hayatou, president of the African confederation Caf. 1998: The Swiss succeeded Joao Havelange and won a bitter election against former Uefa president Lennart Johansson. Blatter, 78, had accused European football governing body Uefa of lacking the "courage" to challenge his leadership. Van Praag, a former chairman of Ajax and a member of Uefa's executive committee who has the support of the Dutch FA, added: "It is well known that I am very worried about Fifa. "I had hoped that a credible opponent to Blatter would emerge, but that's simply not happened. "In that case you cannot just talk but you must also act decisively and take responsibility so therefore I am announcing my candidacy." Blatter has been Fifa president since 1998 and is seeking a fifth term in office. The vote is set to take place in May. The FA chairman Greg Dyke welcomed the announcement and the FA - who are not amongst Van Praag's five backers - will discuss their position on the Fifa presidency during a scheduled board meeting at Wembley on Thursday. Dyke also welcomed Prince Ali Bin Al Hussein's decision earlier this month to seek a place on the ballot and BBC Sport understands the FA board remain open to the possibility of providing the 39-year-old Jordanian with a nomination.